and I got my very special Ravelmpics pin. So, one sleeve is done, and I have one more inch to go on the other one! Even though I have two more days to finish, I am compelled to finish it this minute…talk about knitting obsessions going over the top! I have 5 inches of sleeve plus the ribbing left to go on the sleeves. Shall I stay up late and get it done tonight, or be sane. I’ll find out later. Thanks for all the support in Ravelry, I need it! My badge has arrived and I wear it with honor! So, I started on my Ravelympics socks because I was getting tired of the stockinette body of the sweater. I worked it up through the heel, took it to Knit Night, the fount of Knitterly Wisdom, and the consensus was that the sock was too small for the 7-14 age range. Seriously folks, the size charts for childrens’ socks tell you oh-so-helpfully that a shoe size of this translates to a sock measurement of that. But for those of us without specific children? None of the major charts I found were helpful in letting me know a size range for ages. So, I frogged back to the toe, added more stitches, and I think it’ll fit a kid with a slightly smaller foot than my Ladies’ size 6. 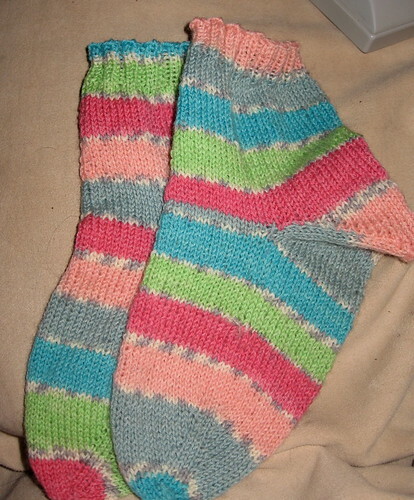 One sock done, started a bit of the toe on the next. She says that I need to add a bit more length, and to stick the edging! Now that I’m knitting green stockinette, it’s seeming to go on and on. I think I’ll cast on for one of my socks. No, not the knitting, trying to awatch everything on the Olympics. Since I figured out yesterday how to configure the Macbook to get the video on this NBC Olympics website, my olympics time can now happen 24/7. This is dangerous, because the NBC gymnastics commentating is so bad (uselessly chatty and way too USA-centric) that I want to watch the full comp on my computer. Then the mens gymnastics team has to totally blow my preconceived notions that any talk of a medal was ludicrous. Wow! They looked SO good that it’s hard to realize that a couple of these guys were last minute alternates. NBC fails me again — while I understand that the East Coast times are live, we on the West Coast could have this all start one hour earlier with no problems, and I would not be going to bed at 12:15 am still not having seen the end of the gymnastics comp. The observant among you will see a mouse — I created that myself with self-striping yarn in crochet for the last Kitty Toy Swap this past spring — may have time for a couple of those. I stuff these with premium cat nip, and this time I’ll include a bell in each as well. and then because I go to an office now, it’s just not practical to bring the two sweaters I’m working on (yeah, I am crazy), so I’ve got leftover sock yarn for some great socks for the Ravelympics.